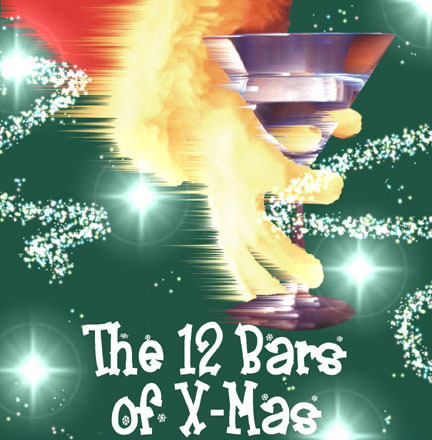 Thanks to the 12 Bars organizing committee: Kurt Austin, Jennifer Bradburn, Chris Festa, Jeff Fujimoto, John Hipolito, Sebastian James, Tom Kucklick, Sophia Malakelis, Tanya Miller, Pam La Londe, Sandi Todorovich, and Sara Vinson. Graphic by Heather Grass. Free Santa Hats for the first couple of dozen folks. Wristbands are free. Just ask an organizer for one. Drink Specials at the bars are pay-as-you go. This event is not for profit or any cause. Just for fun. Deja Vu - Ending Party! Had a great time at this pub crawl? Check our website http://www.chicagofourth.com for details on our other upcoming events and how to join our mailing list! The PPC encourages you to enjoy the event responsibly. © 2002, The PPC Chicago, all rights reserved.